For just a little effort on your part, what Hiking and Snowshoeing allows you to do is go deeper into Antarctica’s interior and reach less visited places where many other visitors simply don’t get to. Hiking and snowshoeing in Antarctica are both fun and cost effective ways to see more of this glittering continent, and a great workout to boot. They’re open to everyone with a good level of fitness and typically don’t carry any extra cost. No prior snowshoeing experience is required. While hiking excursions are offered throughout the Antarctic season, snowshoeing is at its best in Nov & Dec when the snow cover is heaviest. At this time snowshoeing can actually be the preferred way to get around, and has less impact on local wildlife. Both hiking and snowshoeing are group activities, led by expert mountain guides. You’ll be ferried to shore as a group at the beginning of the excursion, from where your guide will dictate the route. Excursions typically last 2-3 hours in duration, but will be judged on general fitness levels of the group. The mountainous topography of the Peninsula limits the chance for longer hikes everyday, however popular hiking places like Deception Island and Orne Harbour mean they are possible. South Georgia actually offers better walking opportunities, of which the most famous is the final leg of Shackleton’s historic journey trek from Fortuna Bay to Stromness. Snowshoeing is an easy (and sometimes necessary) way of exploring the coastline of the Antarctic Peninsula - just strap them on and go! It’s not technically challenging and with a few pointers from your guide, most people quickly get the hang of them. 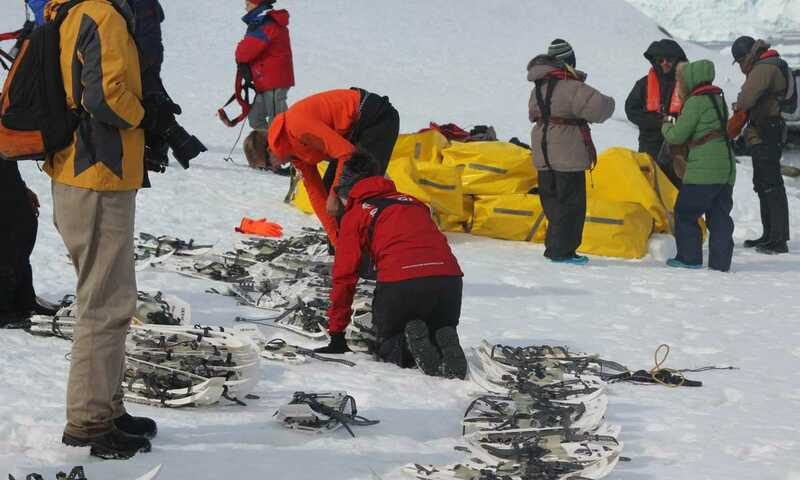 Snowshoes are provided and will be issued to you once onshore; walking poles are also available on some ships. The great thing about hiking using ‘shanks pony’ is that it doesn’t cost you anything. Plus, snowshoeing on many ships is an optional activity which doesn’t attract an additional cost. When hiking/ snowshoeing is charged as an additional cost, expect to pay around $200 per person. Technically undemanding and definitely worth the extra physical effort for the views alone, hiking and snowshoeing in Antarctica are fantastic low-cost, optional activities. Make sure you pack your camera! To be able to enjoy, rather than struggle and hold the group up, you need to be in good physical fitness. Apart from a possible minimum age limit on some ships, there’s no age limit - it's very much open to everyone who would like to. Can I go off on my own? 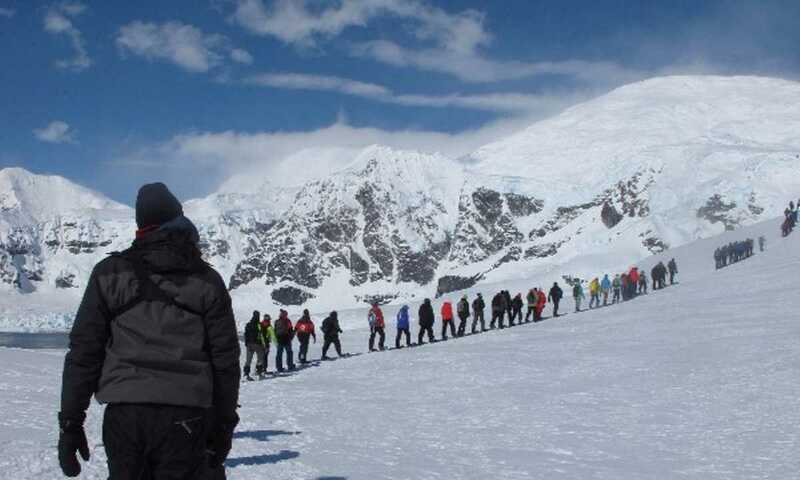 The answer is definitely ‘No’ - Antarctica presents special challenges and in the interests of safety, hiking and snowshoeing operate only as group excursions led by experienced mountain guides and independent exploring is not possible.